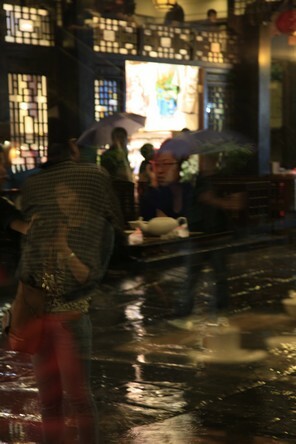 A while ago, in Tunxi in China, I was eating my evening meal in a tea house. Outside it was raining. I used a slow shutter speed to photograph the movement of passers-by, and the reflections of the city on the wet pavements. The window reflected the interior of the establishment. Feeling mischievous, I took a photo of the teapot on the neighbouring table, walking over the silhouettes of people outside. Tea follows us. It accompanies us. Sometimes we don’t see it but it is near and does us good. I wish you a very Happy New Year for 2014. I hope you enjoy discovering new flavours. I hope that every day you find a moment of harmony. I invite you to share these moments of happiness with your loved ones. Vivre le thé.